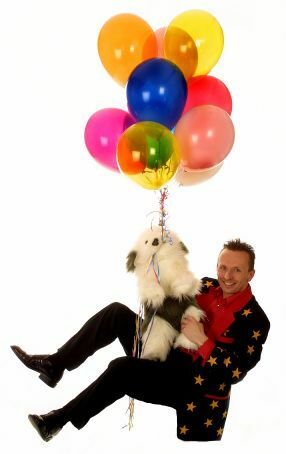 Russ the Magician has been performing professionally since 1990, performing over 300 shows a year, Russ is forunate to be one of the busiest entertainers in the Midlands. Russ can cater for any age and size of group and performs with his friend 'Dave The Wonder Dog'. Pre-school Parties - suitable for the younger audience, full of colour and story lines that the younger children can eaily relate to. 1 Hour Party - An hour of fun, comedy and excitement including traditional Party Games, balloon modelling and a Magic show tailored to suit the age group. With plenty of audience participation, prizes and giveaways, this fast moving show has been developed and is fully self contained and guaranteed to be the highlight of the party. 2 Hour Party - contains all the fun and excitement of the 1 Hour Party with the addition of Professional Disco Lights, PA Sound System and Bubble Machine.